I know. You think I’m early with my holiday salutation. But, I operate on a different calendar, a personal calendar where the new year always begins with Thanksgiving. I feel this makes far more sense than starting after the hangover of the holidays. 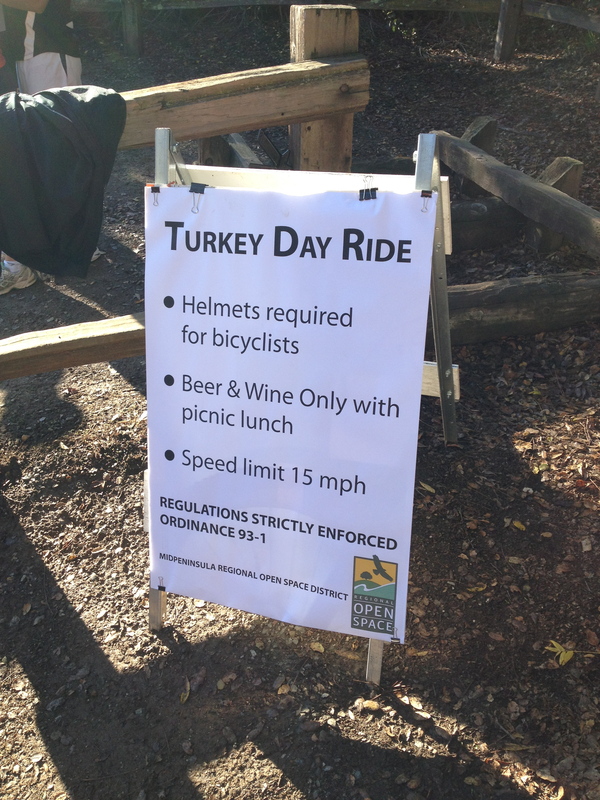 More accurately, for me, the new year commences with the “Turkey Ride” in the hills outside our hometown. 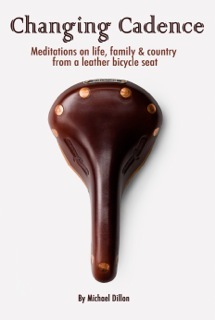 It’s an annual event that combines some of my favorite things: connectivity, community, friends, family and cycling. 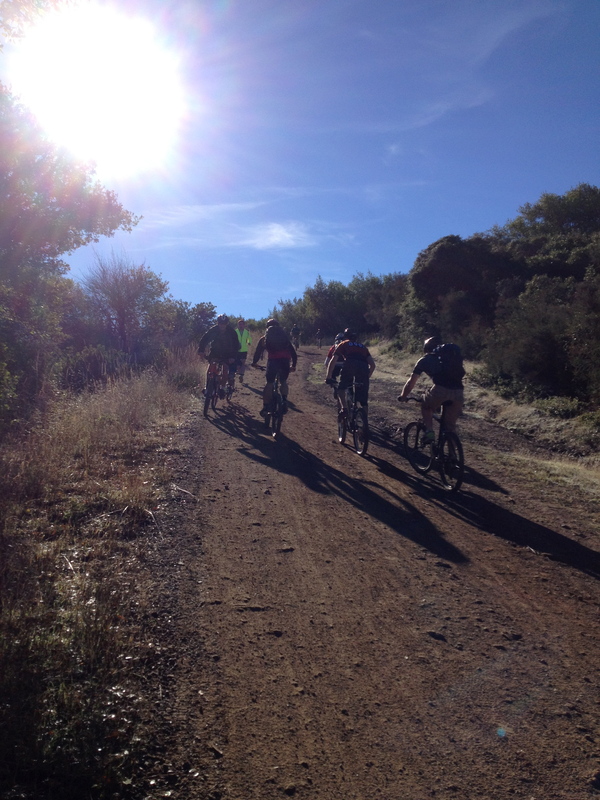 This morning, we started the ride at the Kennedy trailhead at 8:30am with just a few riders around us. As we slowly pedaled the steep climb, we joined more of them. One rider was dressed as a turkey; another was in a Santa costume. A young girl was clothed as Pocahontas. Many were the equivalent of cycling Sherpa, with bikes groaning under loads of food and libations. 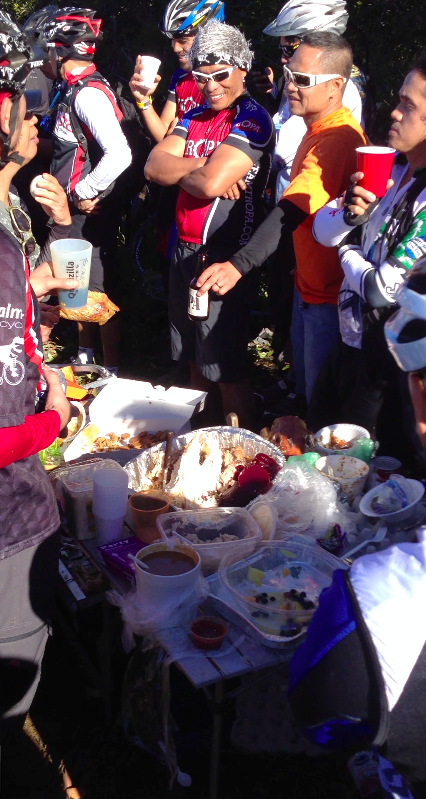 A number of people had containers of food tied to their handlebars or on a rear rack. I saw two riders with large cooked turkeys strapped on their Camelbaks. One group of riders pulled an entire roasted pig on a trailer. The companionship was warm and spirited. You found yourself telling a joke to a stranger, encouraging a young boy making the ride for the first time or applauding a father who was pulling his small daughter on a tandem. 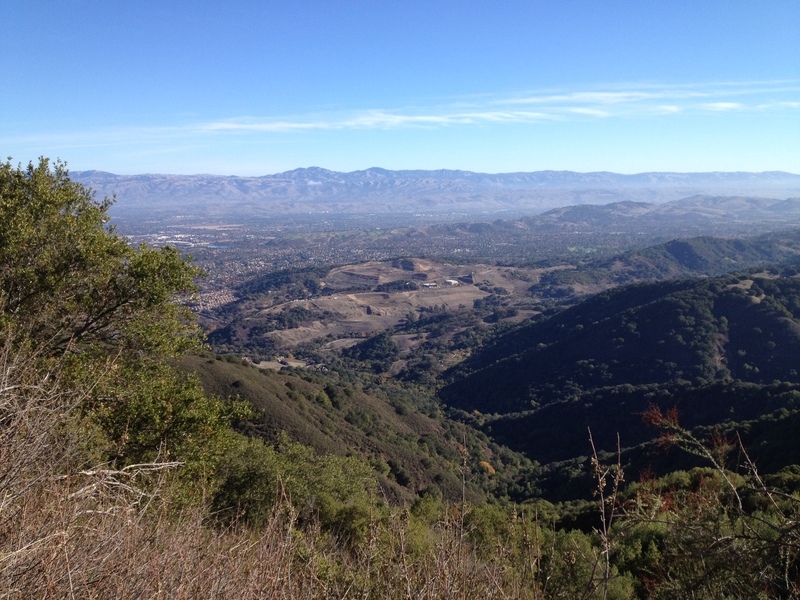 But for most of the ride we just enjoyed a stunning view and the morning aromatics of the toyon, oaks and bay trees. As we neared “False Top”, the first of the two steepest final sections, riders became bunched like Everest climbers preparing to mount the Hilary Step. On the final section, they separated into those who took a look at the pitch and decided to walk and those who wanted to start the holiday season with a personal victory. 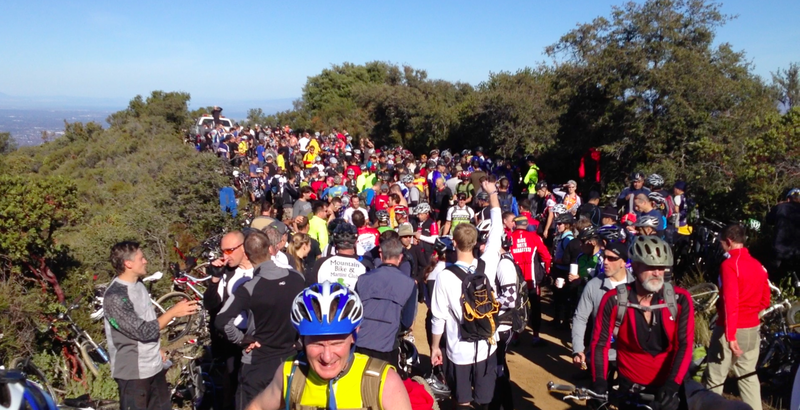 At the apex of the climb, the trail opened upon a mobile block party with more than a thousand riders enjoying a beautiful day with a seemingly limitless view of Silicon Valley. Walking through the crowd, strangers would offer brownies, pork sandwiches, ribs, pumpkin pie, coleslaw and beer…plenty of beer. A number of oenophiles even used the bumper of park ranger’s truck as an impromptu wine bar. All in all, not a bad way to start the new year. 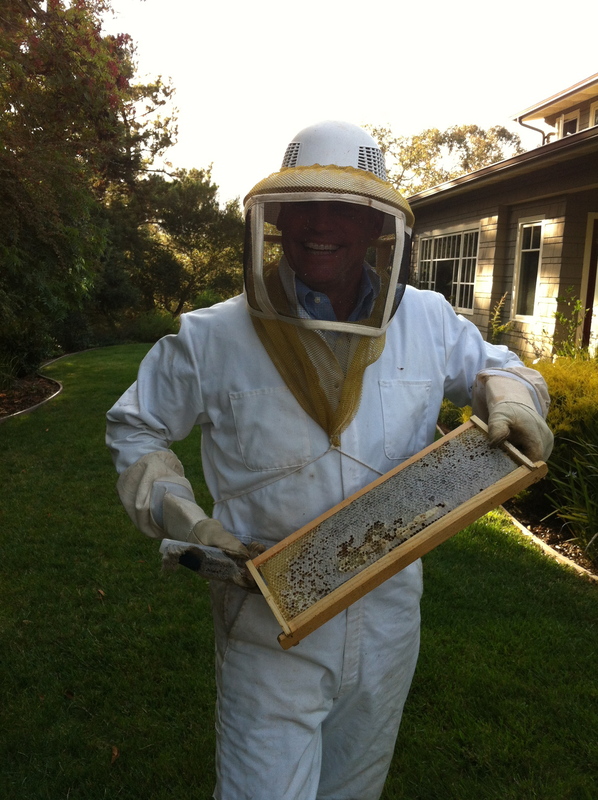 For the past four years, I’ve been working toward my next career – as an apiarist. 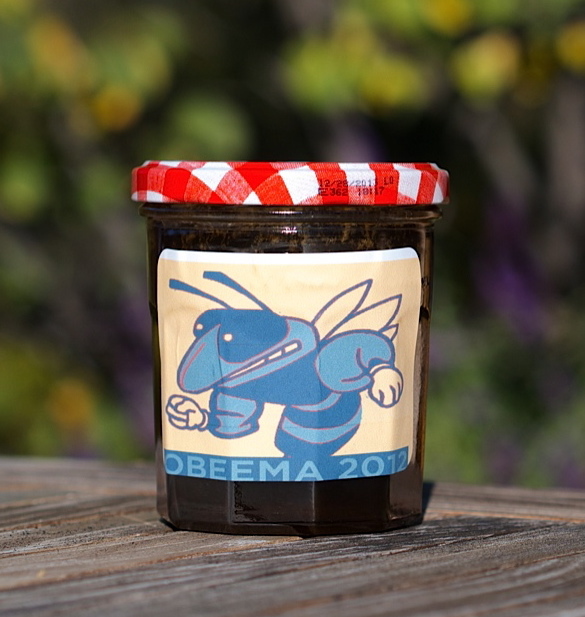 I started because as a gardener, I was concerned about CCD and I thought it would be interesting to learn about producing honey. But, it’s been four years with little to show. The bees just didn’t want to cooperate. I tried checking the hive weekly; feeding the bees with sugar water and even moving the hive to different locations. Nothing worked. The first year, the queen died and the hive swarmed. The second year, the hive again departed this time to take up residence in between the walls of the treehouse I had built for the kids. For some reason, the children didn’t think that bees were suitable pets and I was forced to demolish the treehouse and, unfortunately, the bees. The third year, the bees again split. I still have no idea why. This year, after multiple pilgrimages to our local guru of beekeeping I decided to double down and I started a second hive. Instead of working with the bees, I just left them alone. To my surprise, it worked. I checked the supers (the box on the top of the hive that holds the combs) a few weeks ago and they were almost full of honey. Last week I harvested by removing the combs from the hive and using a heated knife to uncap them. Then I spun the frames holding the combs in a hand cranked centrifuge. The result? A gallon of liquid gold. 1. Among developed nations, the U.S. ranks 23rd in science. I wonder why? 2. In the category of “horses and bayonets“. 3. Seriously, who are these guys. 4. Well played, Rev. Snider, well played (watch to the end). 5. Yeah, I ride like this. No, really.